The climate is tropical, cooled by the north-east trade winds. There is no distinct rainy season. The heat is not searing; the highest recorded temperature is 33°C. Hurricanes may occur between June and November. 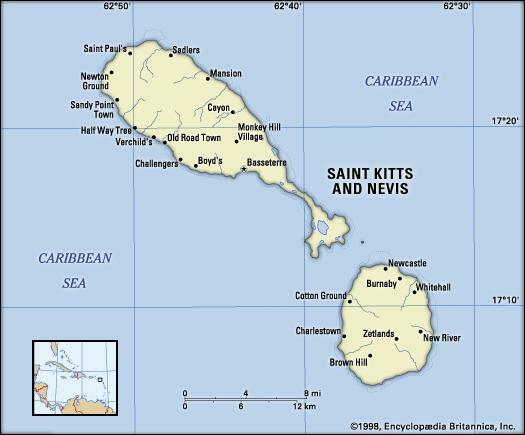 The lower mountain slopes of St Kitts, particularly to the north, are arable and used for growing sugar cane. Uncultivated lowland slopes are covered in tropical woodland and exotic fruits. The higher slopes provide short grass for pasturage. Tropical rainforest or dense bushy cover occurs on the central range; unusually, the forested area is increasing in size. Nevis, where much of the land is cultivated by peasant farmers growing vegetables and coconuts.